Our feline friends can help us to learn a foreign language according to some new linguistic research. Language trainers noticed the popularity of the humorous cat-meme across the Internet. Providing hours of entertainment, cute and amusing photos and videos of cats have become an online trend. There are even ‘superstar’ cats, such as Grumpy Cat, who now has 2.5 million Facebook fans. The language researchers noticed a link between people being able to recall phrases seen in funny photos. After conducting memory tests, they noticed that the photos containing cats seemed to rank higher than all of the others when it came to people’s abilities to recall information. Combined with research from Japan which confirms that ‘cuteness’ enhances memory recall, along with further research that shows learning rates are higher when students are having fun, an idea popped into the linguists’ heads. 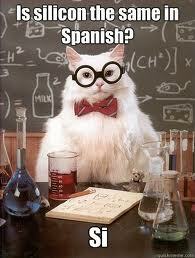 An app has now been created that pairs cute photos of cats with Spanish phrases and their English translations. Sticking to the Internet theme, the masterminds of this app crowdsourced the photos, listing the 1,000 words they wanted to use and asking for uploads of people’s funniest cat photos. With entire websites dedicated to the cat-meme, they weren’t short of replies. The more impact a photo has and the less words it displays, the greater the influence it will have for learning potential. Simple, cute and funny – if only we’d known! What’s your favourite cat-meme and why does it stick out from the others? Do you think this idea has good potential for learning languages? We’re always hearing about how Britain’s falling behind in the language stakes compared with our European neighbours; that we’re a nation lacking in motivation and conviction when it comes to learning new languages. The news keeps reminding us about how the younger generation are failing to step up in their language studies at school, and other media outlets remind us about how we´re missing out in the global job market due to our lack of lingual knowledge. With so much pessimism around, what a good job there are events like the British Academy’s Language Festival to bolster the Brits back up! This month-long event is hosted as a celebration of language learning and as a way to encourage Brits to take up the language learning challenge in order to reduce our monolinguistic mentality. All across the UK, schools, universities and policy makers have been getting together to highlight the benefits that foreign languages have, not just for us as individuals but for our nation as a whole. Novel ways have been used to promote languages to try and get people interested in what is otherwise often just considered to be too much hard work. One group commandeered the kitchen of a Pizza Express restaurant and held a fun workshop where pizza making lessons were given by an Italian. A sixth form group held a tortilla making contest and described how they cooked them in Spanish. The staff from a rental company, which recently started to operate internationally, held a social event where they all took along an international dish, and it was a chance for the different nationalities working there to not only show off their cooking skills (for those who didn’t cheat and pop out to the local supermarket!) but to show off their cultures. In keeping with the food theme, a Bake Off-style competition of foreign foods was held where participants learned recipes in Spanish and French and their efforts were then judged by a panel. Another initiative collected short stories from across the age groups of people’s experiences with the languages they had learned and how they’d affected their lives. People who only spoke English stopped to listen to these stories and realised why learning another language mattered. A language project called Lift (Language: Inspiring Futures Together) has been launched by a sixth form college where students are hosting language road shows, visiting local schools to talk about the benefits of learning languages and supporting students who are currently studying them. Place Blame or Boost Confidence? It’s not just for the employment sector that the importance of learning foreign languages keeps being impressed upon us. There’s no doubt that Brits are missing out on linguistic employment opportunities across the UK as well as globally, but languages also open us up to new experiences and cultures, and speaking other languages boosts our self-confidence and makes us more adaptable. Instead of blame being apportioned towards the educational sector or Brits being blamed for their lack of motivation, the aim of the British Academy’s Language Festival is to stimulate people’s interest in language learning and to encourage organizations to promote languages and cultures in engaging ways by launching social initiatives and supporting new partnerships. Businesses need to take more responsibility towards their staff and support them with language learning initiatives, and more support needs to be given to local communities. Did you take part in the British Academy’s Language Festival? What events did you come across or get involved with? Now that you’ve been bitten by the language bug, it’s time for you to be proactive and put that enthusiasm to good use! You’ve heard of speed dating, but what about speed speaking? ‘Language exchanges’ as they’re known, are the plutonic equivalent of speed dating when you get to hone your language skills. You find an event, you sit at a table, you talk to a complete stranger in their language for a few minutes then they talk to you in your language for the remaining few minutes, then…move sideways for your next quick conversation. Everyone always says that the best way to really learn a language is to speak it but, outside of a classroom where you feel comfortable, confident and know what the subject matter is about, it’s not so easy. Not unless you are lucky enough to be able to jet off randomly to practise your skills abroad. Many of us are really shy when it comes to speaking foreign languages, for fear of getting it wrong and being ridiculed. And if you don’t have foreign friends or colleagues who you can ask for help, how are you supposed to practise? Language exchanges have become very popular in the UK. With so many people now visiting and staying in the UK, there is no shortage of foreigners wishing to hone their English languages skills. So in the same way, they will be happy to help you hone your language skills. Just like the classified ‘partner’ ads, you´ll find many advertising for conversation exchanges, usually arranging to meet in bars or cafés. Like a blind date of sorts, except that the only awkwardness is about how well you are, or are not, speaking their language. It may seem strange at first and you may only meet some people once, but an hour of conversation with a native speaker of the language you’re learning will boost your skills as well as your confidence more than you can imagine. If you’re lucky enough, you might meet a language partner who wants to meet up for regular conversation exchanges. An hour a week speaking with the same person means you’ll be able to progress much faster as you can cover new ground each time, and shyness won’t be an issue. Does an hour of speaking with a complete stranger in a foreign language seem too daunting? Check the newspapers and Internet websites for information about conversation language events. These events will specify the languages to be spoken, where and when the event is being held, the cost for attending and the time frame for each language exchange. Far from the conversation exchanges just mentioned, these events place an emphasis on being fast and being fun. With the drinks flowing, you get just a few minutes to speak to your partner in their language to practise your skills, and then it’s time for them to practise their English for a few minutes while they speak to you. With no time for shyness or awkward silences, it’s time to move on and you’re suddenly sitting opposite a new partner where your few minutes start again. Lively and fun, these events are a great way to get talking in your favourite foreign language! Have you tried a conversation exchange? Was it a private meeting or an arranged event, and did you find it beneficial for practising your language skills? How did the conversation exchange help you to progress in your language lessons? You can’t visit Spain without going to the stunning Alhambra. You can tick both ‘culture’ and ‘history’ off of your checklist once you’ve seen the exquisite ‘Red Castle’ in all its splendour, and you’ll soon realize why it’s Spain’s top tourist destination. You’ll get a crick in your neck from staring up at the shining columns of jasper, marble, onyx and granite as you wander through them; the Mezquita de Cordoba won’t fail to dazzle you. You’ve done the historical bit, the cultural bit, the scenic bit…how about something a bit morbid and gross? In the mausoleum of El Escorial, near the capital of Madrid, you visit the crypt and see all of the marble coffins that hold the bones of the kings and queens of Spain. If that’s not creepy enough for you, knowing that you’re only a few steps away from the ‘rotting room’ might be! It’s hard to miss this sight! You’ll love the cosmopolitan city of Barcelona but you’ll be awestruck at the Sagrada Família. The bizarre and dramatic neo-Gothic style Roman Catholic church is like no other building you will have ever seen…no, really! It’s not actually finished, so take some pics now and then come back to Spain again later to see how they’re getting along. If you like to party, Ibiza is the place to be! As the clubbing capital of the world, it has an unmatched party scene and you’ll want to be a part of it. Loud music, thronging crowds and the top clubs; kick back and party! Visit the medieval city of Cuenca to see the bizarre ‘hanging houses’. Situated between Madrid and Valencia, the houses have been precariously built right on the edges of the steep cliffs, appearing to hang on to them. If you’re brave enough, you can even stand on the balcony of one! It’s hard to imagine how this was built in the first place, let alone how it’s still standing, but the ancient Aqueduct of Segovia was made from 24,000 massive granite blocks without using any mortar! You can take some great photos of this awesome ‘balancing’ monument to show your friends when you get back home…but maybe don’t stand underneath it, just in case. For beach-lovers, La Concha in San Sebastian is the place to go! If you’re planning on sunbathing in Spain then the best city beach in Europe has to be top of your list. So get your sun cream, shades and sunbed ready for a day of chilled out tanning. 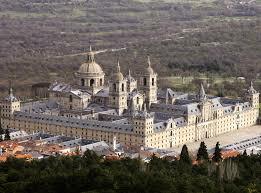 For some family snaps of the royals, try the Palacio Real of Madrid. You´ll be gobsmacked at the luxury in the palace. Although it’s their official residence, the Spanish Royal Family only really use it for state ceremonies, so you might have to make do with a postcard of them instead. For a spectacular sight in Bilbao, make sure you see the Guggenheim Museum. This bizarre looking building has an extraordinary style that you won’t want to miss. Spain has customs steeped in tradition yet it caters for a tourist market, allowing you to explore the culture and history of Spain while having fun in the sun. Spaniards are very hospitable people and you’ll be made to feel very welcome in this country of contrasts; but if you want to experience the country like a true local, give the language a go – brush up on your Spanish skills, pack your suitcase, hop on a plane and head straight for Spain! Have you ever visited any of these Spanish must-sees? Would you add anything to our list? You are currently browsing the Language Museum weblog archives for December, 2013.